Sustainability has never looked this stylish! 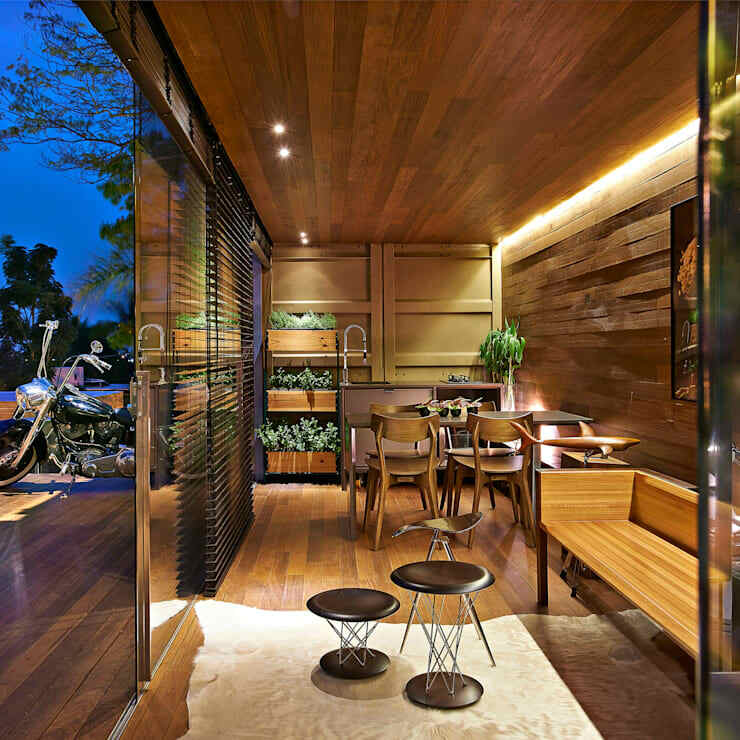 Christina Menezes Architects, based in Brazil, came with the beautiful concept for a container house, transforming a standard issue shipping container into an intimate abode. The integration of natural elements promotes its assimilation into the natural environment around it and the use of glass solves problems relating to temperature. There is an ever-growing consciousness of sustainability and green design. Lately trends have leaned towards living simpler in smaller spaces. Although this house was certainly constructed with that in mind, it does not lack in style and elegance. All of the structural elements, furnishings and finishes combine to create an elegant eco-friendly home which can be easily constructed just about anywhere! Join us to take a look at this innovative project! 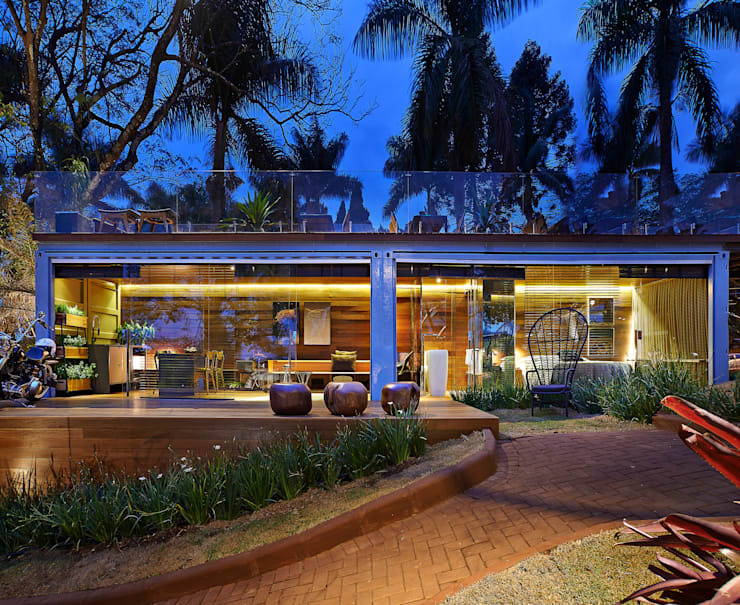 This contemporary and innovative structure delicately blends into its natural environment. Containers are usually associated with dark and stifling interiors, but as this projects demonstrates, that does not have to be the case when converting a container into a home. The space is opened up completely and the front-facing wall is replaced by glass doors. This allows an effortless integration of the interior with its outside surroundings, making the space feel limitless instead of confined to shipping dimensions. 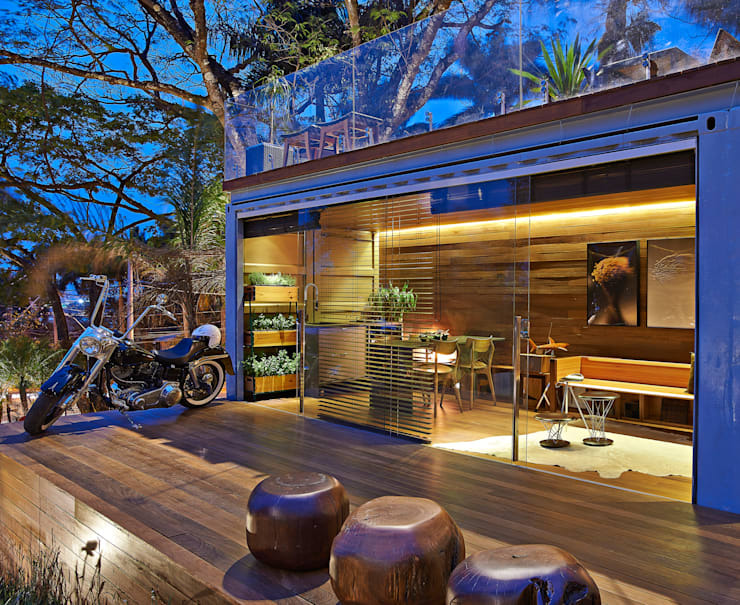 Optimal functionality is gained out of the structure by creating a deck on top of the container. Also surrounded by glass, there is not boundary between the leisure living this top-side patio provides and the vitality of nature enveloping it. Moving effortlessly through to the end of the house, we find a compact and tasteful kitchen. It comprises of condensed counter space, shelves and drawers, including the other kitchen amenities and appliances. We also find a delightful little dining area which is still large enough to accommodate four people and many a meal. It is positively surprising what can be done and fit into such an abbreviated area. The most striking feature and focal point of the kitchen/dining area is the built-in planters. Three wooden planters are stacked above one another to fashion a charming indoor garden! It is both sustainable and useful, and greatly contributes to the aesthetic of the design. Coming inside, the singular are is decked in earthy colours and seemingly much more spacious than what is imaginable for this structure. 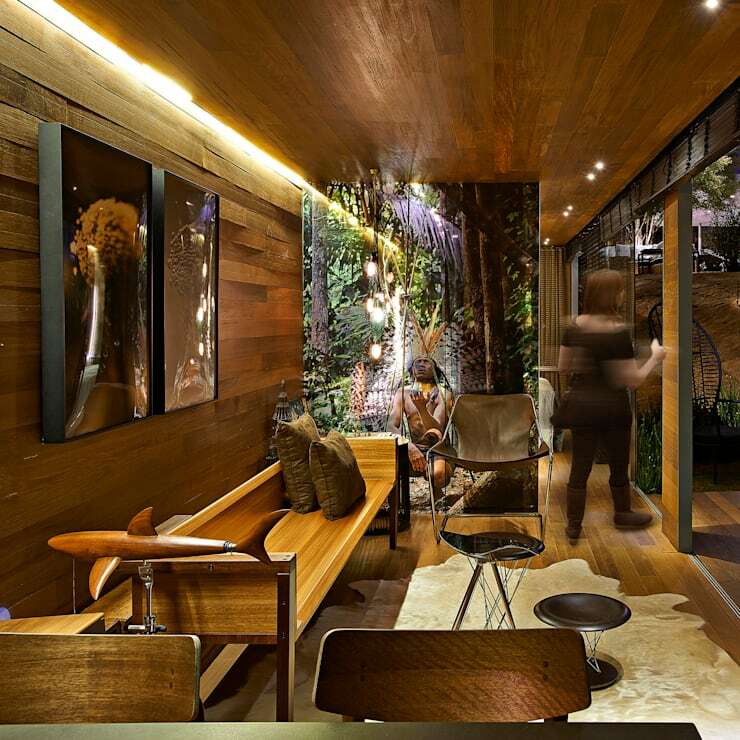 The ceiling, floor and walls are covered with wood, lending a warm atmosphere to the room. 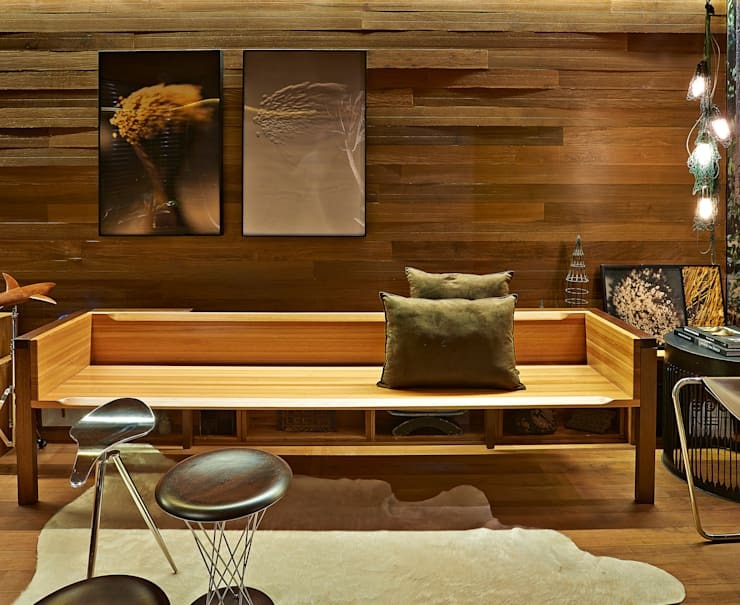 The back wall's wooden planks create a relief pattern that brings an interesting texture to the interior design. This also provides the illusion of more depth in the space. The furnishing are in a neutral palette well suited to the walls, floor and ceiling. The produces a unity that is important in the design of such a small space. It is evident that much time and effort was spent in planning the interior of the distinctive space. Not only do the furnishings suit the layout and structural elements of the interior exceptionally well, it provides optimal practicality. The main piece a furniture in the living area of the house—a beautifully crafted, minimalist bench—provides hidden storage space that keeps the area clear and enhances storage capacity. There is little further adornment, but the prints chosen for this area adds to the natural quality the runs throughout the house. These art pieces are not imposing but also personalises the room. Adding small pieces of mobile and multi-functional furniture, a striking and functional living room is created which is not subordinate to its peers. Now we find the bedroom—it didn't take too long to get there! Gentle perimeter lighting is continued through the house and into this place of rest. Neutral bedding conforms to the natural atmosphere and leisurely blend into the walls, floor and ceiling. Keeping in mind the dimensions of the overall structure, the bedroom does not lack in sufficient space to make it feel comfortable. 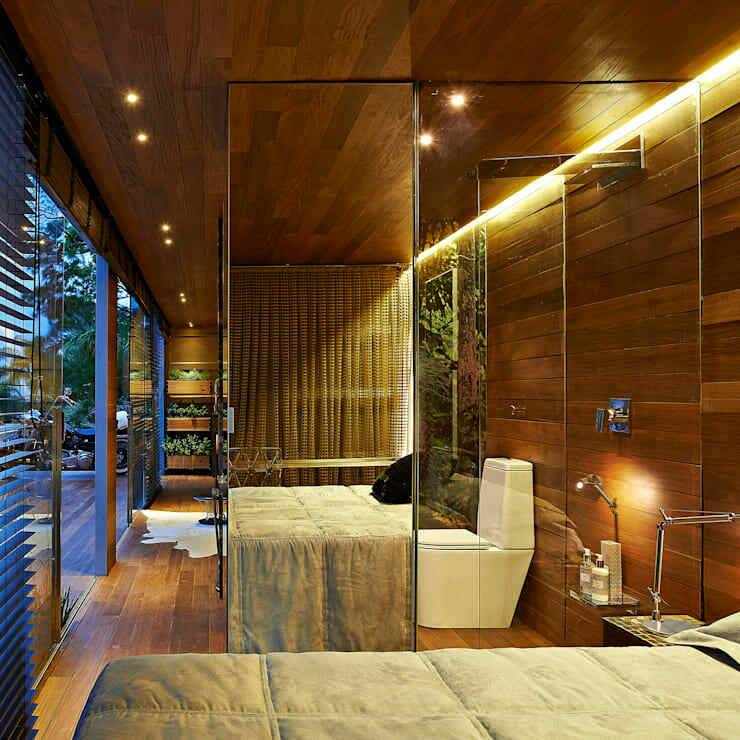 The mirrored wardrobe extends the dimensions of the bedroom to make it feel more voluminous. It is surrounded by glass walls, providing an uninterrupted view of the outdoors, which can be conveniently covered by blinds for privacy. The additional soft curtaining on the side wall provides a gentle touch to this personal room. Whatever the size of a home, the bathroom is the one room that should never be neglected. This is an ethos that was clearly visible in this designing of this house. Working with the space available, the architect structured the bathroom space in such a way to include a private toilet and shower accessible from the bedroom but also from the hall for guests. A statement basin is cleverly situated on the outside of the room for easy access and to solve the problem of limited space inside the room. 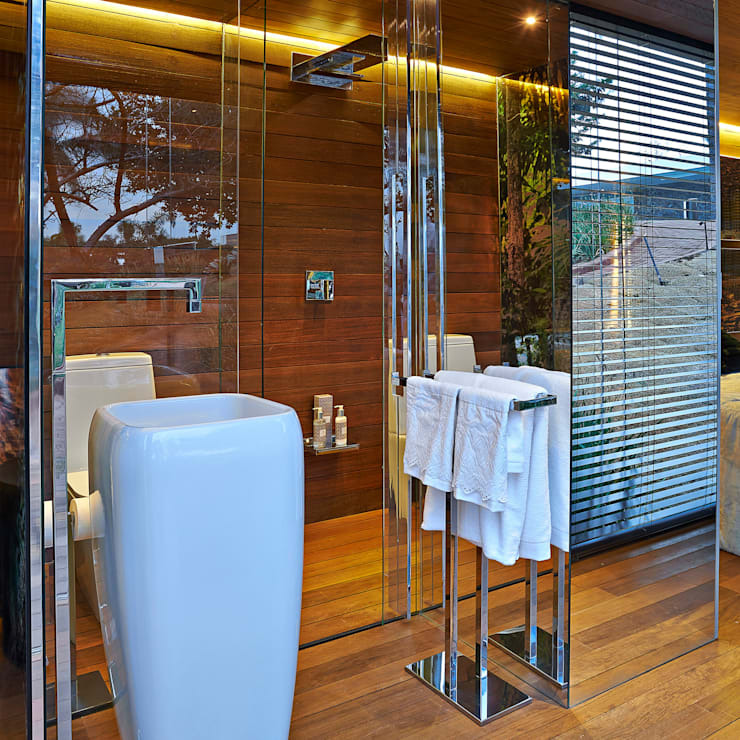 This intimate, well-designed bathroom is ideal for a single person or couple. Halfway along the length of the front side is a open wooden porch perfect for entertaining. This porch extends the inside rooms further to increase its capacity. It also compensates for the slope on which the structure is situated. It seems that there is no limit to what can be done with a container given good planning, imagination and great taste. This project is certainly an exemplary model of sustainability and excellent style. The successful use of natural and complimentary materials, as well as thought-out design elements makes simple living more desirable than lavish luxury. If you're a fan of this housing style, don't miss: Smart Homes That Don’t Contain Their Cool.